It is not an exaggeration to say that world demographics are entering uncharted territory. For the first time in a very long time, perhaps the first time ever, the dependency ratios (loosely, the ratio of dependents to workers) of all rich nations and of several emerging markets have started rising and will continue to rise for several decades. This alone would be enough of a challenge for the world economy. But making things more complicated, it is taking place at the same time as the other big demographic transition of our age, the great population boom in some of the poorest nations of the world. This combination of rising dependency ratios (DR) in developed countries and exploding populations in some of the poorest emerging countries creates a global emergency and a global opportunity. 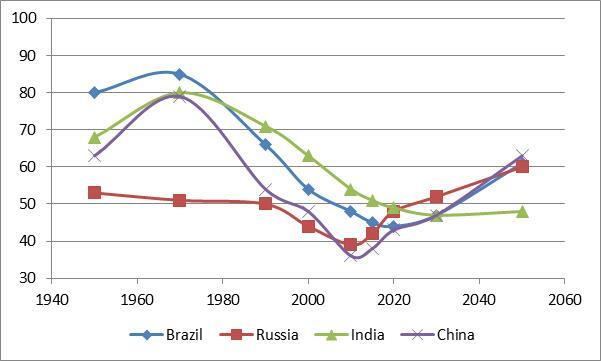 The economies of the West and of China have benefited from large demographic tailwinds in the three decades to 2005. In each country, the population was growing and the dependency ratio was declining, a demographic sweet spot for the economy. This allowed the diversion of capital to higher savings and higher investments, creating a virtuous cycle of more capital and more investments. The result was a very substantial rise in prosperity and living standards in the US, Europe, China and other places. Then, around 2005, the demographic sweet spot started to close. Demography alone is not destiny but it is an important component of destiny. In my view, the other two important components are innovation and institutional strength. When the US economy hit a demographic wall in the late 2000s, the market and economy crashed but innovation and institutions came to the rescue, the first with the creation and growth of technology companies, the second with the intervention by Congress and the Fed to shore up ailing banks and to pump more liquidity into the economy. Apple, Gilead Sciences and other innovators merit at least as much credit for America’s post-Lehman recovery as does the Fed’s multiple QE program. Europe’s weaker recovery can be explained by the scarcity of Apple and Gilead equivalents in the EU and by, until recently, an ECB that has been less aggressive than the Fed. After 2008, the combined effect of innovation and of strong institutions was sufficient to avoid a prolonged recession but not sufficient to produce a fast-growing economy. The missing ingredient, I have argued previously, was the demographic boost which was a key vector in previous recoveries but is nonexistent this time. To get a clearer picture of where we have been and where we are heading, consider the charts below. 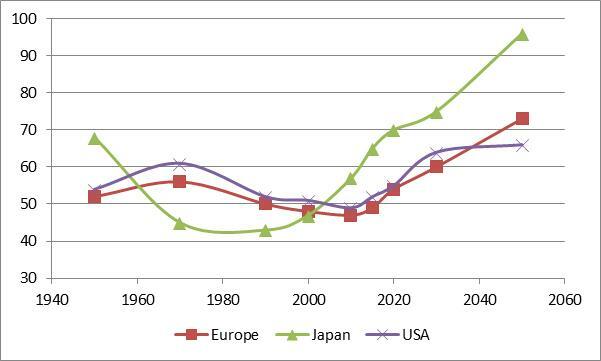 The first chart clearly shows the dependency ratios of Japan, Europe and the US bottoming and rising for the next decades. Japan’s DR bottomed in the 1980s and its economy and markets suffered in the 1990s and 2000s. You may see this timing as nothing more than a coincidence but my own view is that the two are closely related: a bottoming and subsequent rise in the DR made recovery difficult in the 1990s, despite the boom in US and European economies and markets. So, if the DR is an indicator, the demographic component of growth in the US and Europe has turned from positive before the late 2000s to negative in the present decade and for some time to come. The second chart (below) shows the dependency ratios for the BRIC countries. Here again, with the notable exception of India, all DRs are bottoming in the present decade and starting a long climb. China with its one-child policy saw the biggest fall in its DR after 1970 and will now see the steepest climb. The fact that the Chinese economy happens to be weakening at the same time as the DR is bottoming and starting to rise can also be seen by some as a coincidence. But after several such examples spanning several different regions and time periods, even the most committed skeptic ought to consider that there is indeed close causation, not just correlation, between a country’s DR and its GDP. In the United States, the dependency ratio will rise but the overall size of the population will continue to grow, albeit at a declining rate. This is not true of Europe where the DR will be rising and the population will stagnate at its current size of 740 million and taper off modestly in later decades. Germany, Italy and Russia will see their populations shrink while France and Britain experience low growth. German dominance over as demographic crunch worsens worries about the expected shrinkage in Germany’s work force. The unrealized horrors of population explosion revisits Paul Ehrlich’s The Population Bomb to expose that he was plainly wrong about… well, everything. Emerging economies demographic challenge worries that the labor force in China and other countries is shrinking but is hopeful that this drag on the economy can be offset by productivity gains. Mediterranean migrant crossings to Europe top 100,000 in 2015 keeps count of the influx of people, mainly from sub-Saharan Africa, risking their lives to reach Europe by boat. The last one addresses the second facet of the global emergency: fast population growth in economies that are too weak to absorb this growth. To get a better idea of what this means, consider that the populations of sub-Saharan Africa and of Europe were roughly equal a decade ago at around 740 million each. But sub-Saharan Africa today counts over 900 million people and in the next 35 years, its population will grow to over 2 billion while Europe’s declines to 710 million. See chart below. These numbers are from the United Nations Population Division’s medium variant which assumes a rapid decline in the total fertility rate (TFR, number of children per woman) of sub-Saharan Africa. Were that TFR to remain as elevated as it is today, the population of sub-Saharan Africa would rise to over 2.5 billion. Were the TFR to decline faster than expected (UN’s low variant), the sub-Saharan population would still reach 1.8 billion in 2050. These figures may or may not be inflated. It is difficult to conduct a reliable census in many of these countries. In addition, forecasting over several decades is likely to include erroneous assumptions. For example, if economies don’t improve quickly, the TFR may fall faster than predicted because larger families would encounter greater hardship. Conversely, it may not fall as fast as predicted by the UN. Experience shows that the TFR declines when infant mortality falls and women’s health care improves. In any case, what is certain is the general direction of demographic growth. 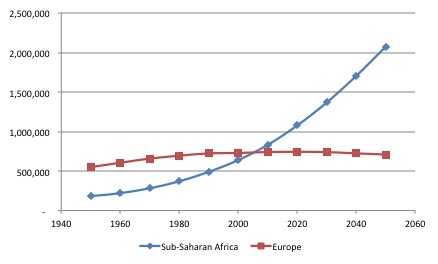 Even if the population of sub-Saharan Africa grows to 1.5 billion instead of 2 billion by 2050 (which would be lower than the UN’s low variant), this increase would amount to over 600 million new people, or nearly twice the current population of the United States. These are massive unprecedented numbers. Given sufficient choice, comfort and security, an overwhelming majority of people would prefer to stay in their country of birth rather than emigrate to foreign countries where they are sometimes (or often) unwanted and difficult to integrate in already wobbly economies. The opportunity therefore is to strengthen economic conditions in these poor nations in order to help them absorb the population boom. Or better: in order to help them channel this population growth into a higher standard of living for everyone. This may seem as a daunting and overly optimistic task but we have the encouraging precedents of China and other emerging markets, countries which have translated rapidly falling TFRs into faster economic growth. There is an opportunity for a symbiotic solution for both the demographic challenge faced by maturing developed nations (and China) and the other very different challenge faced by younger emerging nations such as Nigeria, Ethiopia, India, Pakistan, Bangladesh, Indonesia and the Philippines. These are the countries that are moving into the top 10 population super league by 2050. Note in the table below the biggest populations ranked by their 2050 sizes. 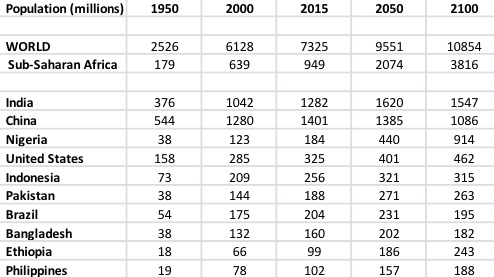 A similar top 10 ranking in 1950 included four European countries (Russia, Germany, Great Britain and Italy) but there will be none left in the top 10 by 2050.
create large new demand markets for Western products at a time when domestic demand is weakening. provide food, shelter, health care and jobs to growing populations in sub-Saharan Africa and other countries. strengthen institutions, facilitate capital formation and investments, and increase transparency in governance in emerging markets. mitigate disorganized migration, and lower the risk of instability. The twin effects of stagnating populations in the West and of booming economies in Africa and Asia create an unprecedented challenge for policy makers. Inaction is no longer a reasonable option. For the West, the costs of inaction include a dearth of demand markets for Western products and services, a surge in clandestine immigration and a heightened risk of terrorism. For young emerging nations, the costs of inaction are poverty and instability made worse by the population boom.